The December issue of the IPA Review has, on page 8, a full page picture of the Eiffel Tower supporting a wind turbine as an opener to Daniel Wild’s leading article on the Paris Accord. Before launching the blog, DeFrock, presented as a practical help to those country residents and farmers fighting wind turbines, consulted a well known artist (also a talented cartoonist) to design an appropriate logo for the blog. 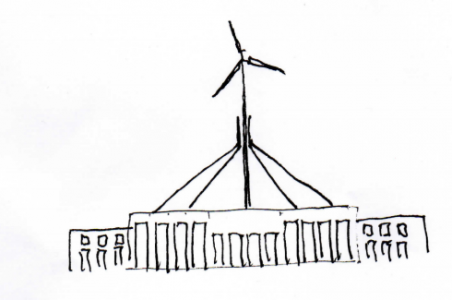 The chosen logo was a wind turbine seamlessly arising from the apex of Parliament House. The DeFrock team was delighted with the concept and first published the blog complete with the logo in August 2018. DeFrock thinks its parliamentary version is brutally true, whilst both cynical and sardonic. In addition to “How To” posts DeFrock is collecting files which, if used carefully, will assist in court actions against wind projects. DeFrock is amused that the IPA has recognised the significance and impact of the dominant turbine theme. Next Post Are You or Members of Your Family Windsick?